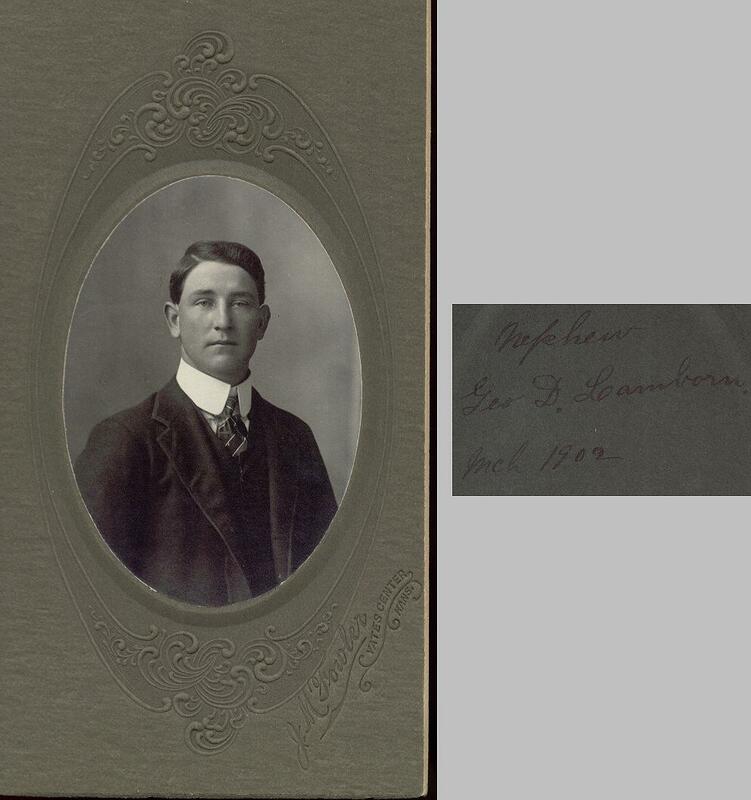 Comments: George D Lamborn (Nee: ) | Ks | 1901-1920 | Comments: ///Photographer F.M Fowler Archive # 23072//*Nephew George D Lamborn Mch 1902---DeadFred recieved these photos in the mail as a donation from bybuttonlady@yahoo.com . The donation contained three large manila envelopes filled with photos in a box. On eac envelope was hand written surnames with each envelopes group of surnames being different from the others . In the course of scanning them I found connections in names among them all therefore Ive decided to put them collectively in one group . If you click below you will be able to see all the photos that came in all three envelopes,. Ive added the search term Yarberry A,B,or C to the comment section of each photo to designate which names came in the envelopes together. Envelope A contained the following Surnames : Jenkins,Battey Whinery,Gross,Mendenhall,Pyle,Lambon ,Woolman . Envelope B: Hayes,Pyle,Lambon,Gross,Hogue,Rose .Envelope C:Ridlon,Hayes,Chenyney,Putnam, Smith,Walton,Mathers,Hilbe. If you go to the home page and type into the keyword yarberryB into the *comments search* section this photo group will come up These are a very nice collection of family photos. Write to bybuttonlady@yahoo.com if you have any questions about the people in the photos. Write Joe@deadfred.com if you wish to claim a photo , wnat an enlarged scan or have a question .